I’ve always been a big fan of Kashi products, and when they released their new line of TLC Pita Crisps, I was totally excited to give them a try. I love a good crunchy snack, especially pita chips, but it’s not always easy to find ones that are both yummy and Weight Watchers friendly. These new Kashi Pita Crisps have just 3 Points per serving, and each serving is 11 crisps. What I do, to prevent myself from eating more than 1 serving, is to divide the whole box into individual servings and store them in little Ziploc bags. That way, if I need a quick, healthy snack on the go, I can just grab a little pre-portioned bag, rather than stand there and count out 11 crisps. Plus, if I’m snacking on them at home, I tend to feel guilty going back for another bag, so I just stick with one, and that helps keep me in control. 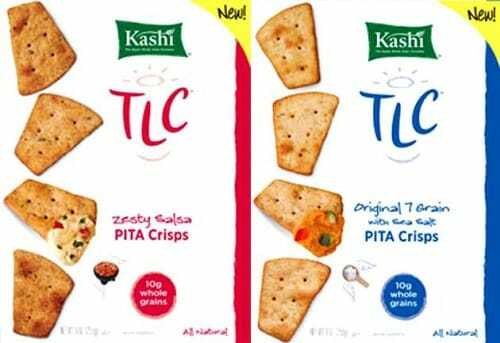 Wanna learn more about Kashi’s TLC Pita Crisps? Keep reading!! According to Kashi, their TLC Pita Crisps are made from a unique blend of 7 whole grains, baked to toasty perfection into crunchy, puffy crackers. Both savory varieties are crunchy snacks you can feel good about craving. Naturally, Pita Crisps are free of artificial flavors, hydrogenated oils, and cholesterol. Each serving provides 10 grams of whole grains, 5 grams of fiber* and 3 grams of protein. Yay!! And they currently come in 2 different flavors: Zesty Salsa and Original 7 Grain with Sea Salt. Want to know where you can find them? Just enter your zip code to find a retailer nearest you. Thanks to the $1.00 coupon that came with your description of this product, It made it easier to decide to try them! I just want to say that your blog has saved me from quitting WW due to boring food. Unbelievable how good the recipes are that you have accumulated here. I don't need any other cookbook – all I need is right here. THANK YOU!! !